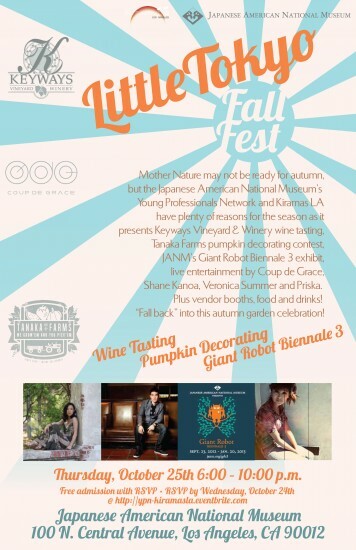 Mother nature may not be ready for autumn, but the Japanese American National Museum’s Young Professionals Network and Kiramas LA have plenty of reasons for the season as it presents Keyways Vineyard & Winery wine tasting, Tanaka Farms pumpkin decorating contest, Photo booth by Shake That Boothy, JANM’s Giant Robot Biennale 3 exhibit, live entertainment by Coup de Grace, Shane Kanoa, Veronica Summer, Priska. Plus vendor booths, food, and drinks! “Fall back” into this autumn garden celebration! Immediately following Little Tokyo Fall Fest.